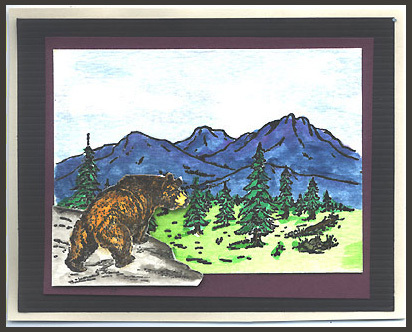 “Bear on Ledge, Lg.” and “Mountain Scene” were embossed in black on watercolor paper and colored with watercolors. The mountain scene is layered on brown, black and grey card stock. The bear and ledge are cut out and mounted over the picture with foam dots as well as over the brown layer. Card by Anaka Kagen.